Cameron, Marion W., 97, formerly of Liverpool, passed away peacefully at Ocean View Continuing Care Center, Eastern Passage, Nova Scotia, on February 23rd, 2012. Born in Bridgewater, she was the daughter of the late Fred and Winnie Dodge. Prior to her marriage to Milledge Cameron in 1948, she worked in various retail stores and as a telephone operator in Bridgewater. After moving to Liverpool, she was involved in a number of organizations at trinity Anglican church. She enjoyed playing bridge and golf. She is survived by her only son Andrew (Sandra), of Dartmouth and grandchildren Blair, of Inverness, Nova Scotia and Kristen (Philip) Guay, of Rockland, Ontario; great grandson Ethan Guay; sisters in law Barbara Dodge, Bathurst, New Brunswick, Vera Morgan, of Digby and thirteen nieces and nephews. 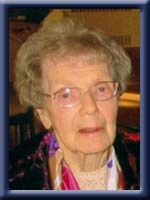 She was predeceased by her husband Milledge in November 2009 and brothers Ronald, Paul and Herbert. So sorry to hear of your mothers passing, my thoughts are with you at this difficult time. Keep her memories close, they do bring comfort. Andy & Family -So sorry to hear of your Mother’s passing. Our thoughts and prayers are with you during these difficult times. Andy and family – My thoughts are with you and your family at this sad time. Memories or our childhoods on College Street and the close friendships of our Moms. Those were such good memories and I hope you treasure them as do I.
Andy & Family – Sorry to hear of your Mother’s passing. Our thoughts and prayers are with you during these difficult times. To the Cameron family Our thought are with you at this sad time . We live on the same street with your Mom and Dad they were a lovely couple . i did some canvassing and everytime i went there they would take me right in the living to have a chat with them . Thinking of you all . Jackie and Gordon . we were so sorry to hear of your Mom’s passing.Growing up on College Street next to your family brings back a lot of great memories.Our condolences to you all. Sorry to hear of your mother’s passing. She was indeed a wonderful person. Take comfort in the fact that she will once again be united with your father. They were a wonderful couple and always willing to pitch in with whatever was happening on College Street. Our thoughts and prayers are with you, Sandy & Family. Dear Andy, Sandy and family. So sorry to hear of your mother’s passing Andy. I have fond memories of both your parents, especially through events at Trinity. May your own memories carry you all forward. Dear Andy and family: Our thoughts and prayers are with you all during this difficult time. So sorry to hear about your Mum, Andy. We always enjoyed them living next door on College St. They were lovely neighbours and great friends of our Mum and Dad. Our thoughts and prayers are with you at this difficult time. We are so saddened to hear of your dear Mom’s passing. So many memories come flooding back as one remembers the wonderful families on College Street and the wonderful parents that you had as part of that closely knit circle. We remember well the visits back and forth from your house to ours and how much we enjoyed those wonderful times. How your Mom loved her grandchildren and was so proud to talk about their accomplishments. To go on without Milledge must have been so difficult but now they are together again. We are all thinking of you as you travel on without her but having her at peace will be a source of comfort somehow. Sincere sympathy to Marion’s family. Thinking of you and sending our sincerest condolences in the passing of Aunt Marion. Let us know when the service will be at Brookside & we will be there too. Dear Andy, 97! Your mother’s face will remain familiar to so many of us for a long time to come. And she looks lovely in this photo, wearing her brightly coloured scarf and with her hair done. Though, like my mother, if she’d known that she had wrinkles she would have rested her chin on her hand to hide them (I pass this helpful tip from my mother on to you). My mother is 94 and 1/2, (months count). Women did not have the right to vote when our mothers were born, they were women shaped by the great depression and a world war which, as Mom says, “just effected our whole time.” Then if that wasn’t enough they got us, the me generation! Thankfully they survived long enough to become interesting to us. We are so fortunate to have lived through several phases of friendship and shifting roles with our mothers. I know that you will miss your mother Marion. And I will miss hearing about her…actually I hope you continue to share stories of your parents. Please accept my condolences Andy and know that I am thinking of both you and your mother. Our deepest condolences are coming to you from all of us in Oklahoma. Please know that our thoughts and prayers are with you during this difficult time. Aunt Marion was a beautiful and kind lady and she will be missed dearly by all who had the pleasure of knowing her. Love to all of you. Ann, Danny, Bryan and Bradley.